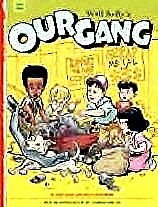 Our Gang by Walt Kelly! Our Gang/96 pgs. & $12.95/art & story by Walt Kelly/available at www.fantagraphics.com and comic and book stores. If you love the Our-Gang films and the comic strip Pogo, then you'll love Walt Kelly's Our-Gang, right? Before he created Pogo, master cartoonist Walt Kelly drew a comic book loosely based on MGM's version of Our-Gang, the series also called The Little Rascals. He wrote and drew almost 100 Our Gang stories during its 59-issue history that ended in 1949. Fantagraphics has published the first in a series of trade paperbacks reprinting the entire run. When I heard of the project, my heart leapt. When I read the first volume, my heart fell. This is not Kelly's best work. The Our Gang films were character-driven, and herein lies the weakness of the Our-Gang comics. A person's character is partially revealed through his or her voice as well as through body language – the way a person stands and moves. As example, it is impossible in a comic book to hear Froggy's raspy voice, or capture the complicated gestures and stances that visually help define any person. That Kelly doesn't do so is not his fault. It is also apparent that Kelly was more comfortable drawing animals than humans at this point in his career. His line work is not poor, it is average. That is Kelly's fault. Poor coloring in this collection doesn't help either. Finally, Kelly's dialog and plots are true to the films, but the comics were written for a young audience; adults may find them difficult to embrace.